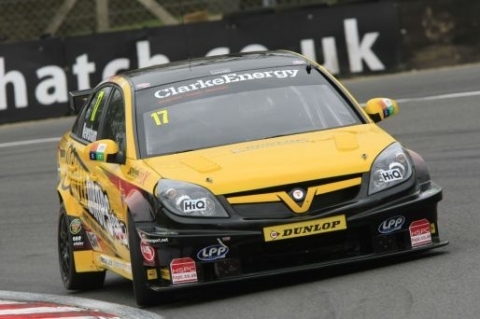 Dave Newsham has taken a shock pole position in the Dunlop MSA British Touring Car Championship’s first qualifying session of 2012 at the Brands Hatch circuit in Kent. Inverness’s Newsham (pictured), driving a Vauxhall Vectra for the tiny ES Racing.com team, set a best lap of 48.483s early on. All the fancied front-runners then had their attempts thwarted by ‘traffic’ on the cramped Brands Indy circuit and could not beat him. It meant a career-first pole for Newsham who will line up at the front of the starting grid for the first of tomorrow's three races. Worcestershire’s Matt Neal, the reigning champion, was second fastest in his Honda Yuasa Racing Team Honda Civic ahead of Hampshire racer Robert Collard’s eBay Motors BMW. Lichfield’s Andrew Jordan equalled Collard’s time to end up fourth in his Pirtek Racing Civic and it could have been higher had he not stumbled across the slowing car of Newsham’s team-mate Chris James on his final flying lap. Collard’s team-mate Tom Onslow-Cole, from New Malden, was fifth ahead of Oxford’s Jason Plato, the double Champion an impressive sixth in his MG KX Momentum Racing MG6 on its debut outing. Meanwhile’s Neal’s Scottish team-mate Gordon Shedden, last year’s championship runner-up, was back in ninth after his car joined the session late following on-going mechanical problems in practice. Another of the top names, Mat Jackson, was back in 11th in his Redstone Racing Ford Focus ST.
Tomorrow’s three races will be shown live during a mammoth seven-hour broadcast on ITV4 and ITV HD as well as the www.itv.com website.